Toyota's hybrid cars are just for eco-weenies who like to drive slow, right? They aren't for anyone who cares about performance, right? Wrong on both counts as of today. Meet the 420 horsepower Toyota Yaris Hybrid-R concept, which does not sound like it is messing around. This high-tech hot hatch concept is set to debut at the Frankfurt Motor Show next week, but Toyota showed off its rather impressive specs early this morning. First, it's all-wheel drive. Power to the front wheels comes from a 1.6-liter turbocharged and racing-developed four cylinder engine that produces 300 horsepower. Each rear wheel gets power from a 60 horsepower electric motor, which bump total juice to a full 420 horses. That's pretty impressive for such a tiny little car. 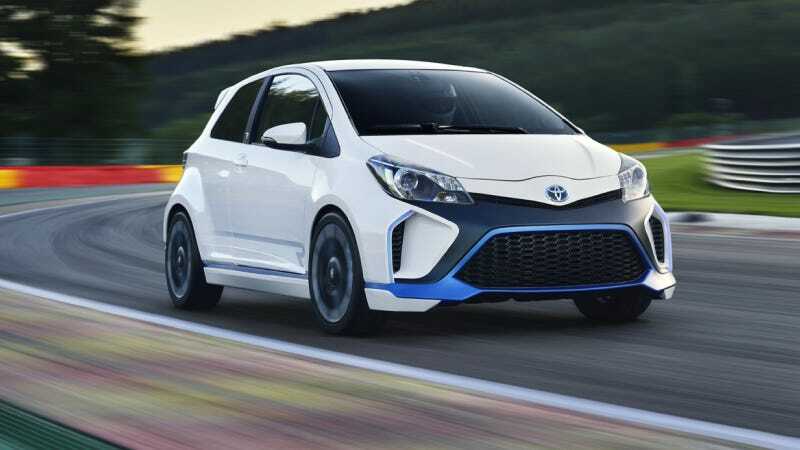 The Yaris Hybrid-R also uses the kinetic energy recovery system from Toyota's TS030 Le Mans prototype car, stuffing a supercapacitor under the rear seat. But wait, there's more! The Meanest Yaris Ever has a third electric motor between the engine and 6-speed sequential transmission that acts as a generator during acceleration and deceleration. Partnered with 18-inch wheels, Michelin Pilot Sport Cup tires, Recaro seats, pedals from the Toyota GT86/Scion FR-S and other goodies, and you have what sounds like a thoroughly modern and badass little hot hatch. Unfortunately, no word from Toyota on zero to 60 mph times or anything like that, but I would imagine it's pretty quick. Also no word on production plans, but if I had to guess I'd say it's unlikely. Still, it's a great concept, and if it shows where hybrids are going I'm all for it. This has definitely been the year of the hi-po hybrid car and it's awesome to see that tech trickle down into cars the rest of us could potentially own. Plus, they made the Yaris interesting. That's gotta count for something.